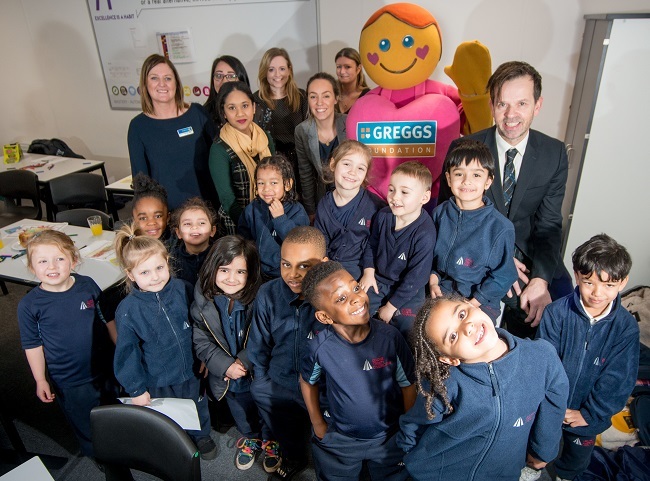 Ward Hadaway's Leeds office has partnered with Greggs to sponsor breakfast at Dixons Trinity School in Chapeltown in the city. Ward Hadaway and Greggs Foundation launch the latest Greggs Breakfast Club Programme at Dixons Trinity Chapeltown in Leeds. The initiative forms part of the firm’s ongoing commitment to support local breakfast clubs at schools in Newcastle, Leeds and Manchester. Greggs Breakfast Club Programme has been running since 1999 and aims to help primary school children get a nutritious start to the day. Every school involved in the programme is provided with fresh bread from their local Greggs shop, and there is also a grant to support start-up and ongoing costs. There are now over 500 breakfast clubs providing free breakfasts every school morning to more than 32,000 children, helping them get the best out of their school day. Executive Partner John Murray with some of the children. John Murray, Executive Partner for the Leeds office, said: “We recognise that food insecurity is a significant and growing issue in the UK with levels of hunger now some of the worst in Europe, according to a new report from the Environmental Audit Committee. Lynne Hindmarch, Breakfast Club Manager for the North and Pennines, said: “We are delighted to be working with Ward Hadaway’s Leeds office to support children and families at Dixons Trinity in Chapeltown. Julie Harrison, Partner and Head of the CSR Committee for Ward Hadaway, added: “As a Top 100 UK law firm, we have been giving back to the community for 30 years and the Newcastle office has been working in partnership with Greggs Foundation for six years now. We are delighted to now extend our involvement with the Foundation to Yorkshire.